I was honored to illustrate this sweet childhood friend, Winnie and her husband! I love watching my friends fall in love and I am always amazed by the unique story being written in each of our lives! 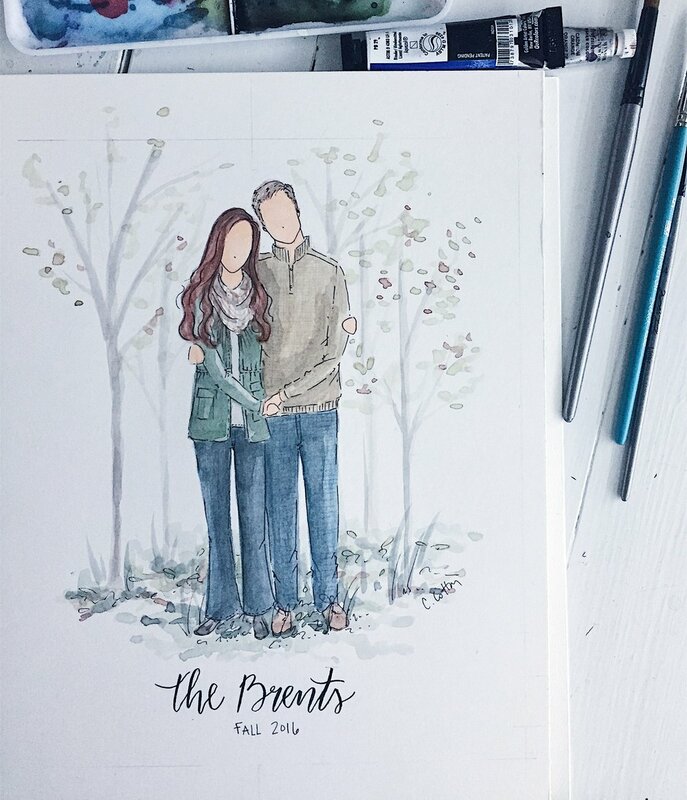 When I paint an illustration, I pray that it would help that individual celebrate each season of their story as well as help them remember the unique stages of their life. Read below to hear more from Winnie about her sweet relationship and how they celebrate their love story! "We are the product of a long distance relationship. A boy from the Eastern Plains found a Southern Belle! After 7 months, Caleb proposed and I moved to Colorado a few weeks later! It was an instant thing where we both knew immediately we were only meant for each other. (As cheesy as that sounds!) And in March we will be celebrating 4 years of marriage, which blows my mind! We are definitely opposites... Caleb is more on the quiet side, and pretty reserved. Then there's me, very bubbly and heart on my sleeve! We really balance each other out, and I'm so thankful for his strength when I'm weak - and my strength when he's weak. But ultimately, our strength comes from the Lord! We've learned that marriage in itself is a testimony, and all glory goes to God. We are both far from perfect, but it's an amazing thing to have a partner who points you to Jesus amidst your downfalls. Marriage has immensely blessed my life and taught me the beauty of grace, forgiveness, and unconditional love. " Listening to audiobooks and podcasts while I illustrate is something that I love and do on a daily basis. It has been such a blessing to listen to amazing words of wisdom and historical works that I otherwise, if I'm honest, would not take the time to read or listen to. I thought I would share some of my favorites that have been most impactful to me lately! Some of these listed are just fun and interesting and some have deeply impacted my journey with Jesus. I hope you enjoy them as much as I have! Hi friends! Today on the blog, my dear friend Elizabeth is going to share the story behind two illustrations that I did for her family. Their family dynamic is so special and it was a joy to get to illustrate them! Thanks for the introduction, Catherine! Like she said, I’m Elizabeth. I’m so happy to be able to share the story of what Marry Me In Spring has meant to my family! First, a little background. My family is basically the modern version of Little Women. I have three sisters: Sarah is our oldest, I’m in the middle with my twin sister Anna, and Mary Claire is our youngest. We also have awesome parents who we love. We spent our college years living in different states until all the sisters ended up at Baylor University for one year. Baylor also happened to be the place where Sarah met her future husband, Kyle (who is the perfect brother we never had). Kyle proposed to Sarah at the Dallas Arboretum, and my sisters and I got to surprise her after she said yes! Wedding season was on. We wanted to give Sarah a memorable gift, something she would treasure as her gift from her sisters. Sarah is our resident fashion guru, and even designed her own formal dress in high school. When she found her wedding dress it was the epitome of her style: elegant, classic, but still right on trend. We knew that she would want to remember it forever, so we decided to have Catherine illustrate Sarah in her gown from her bridal portraits. Catherine’s illustration made Sarah look like she was straight out of a fashion designer’s sketchbook, and it captured her personality perfectly. On the morning of Sarah’s wedding we ate breakfast as a family and surprised her with the illustration. It made the day even more special. 6 months later at Christmas, Sarah gave us the best present ever: an illustration of the four sisters together. She wanted to give us something as a reminder of our special relationships as sisters and this unique time in our lives. The illustration captures our personalities, similarities, and differences. It was the most thoughtful gift, and we were all so surprised. She had prints made for the sisters and one for my parents to have at home. Every time I look at my illustration, I’m reminded of this sweet season of life with my family and how grateful I am for my sisters.